Our Jewelry Designer’s Blog covers trends in jewelry design, what inspires us, exhibits and our custom jewelry projects. Shown above is a Carved Moonstone from the National Gem Collection. Moonstones are beautiful gems from the Earth. While researching gemstones for a custom design project, I came across some interesting new to me - gemstone facts from AGTA, the American Gem Trade Association. Shown here is a checker board cut moonstone cabochon, set into a sterling silver frame ring. A one of a kind design by Kathleen Lynagh Designs to highlight the gemstone's fine qualities. The ancient Romans theorized that moonstone, with its unearthly shimmer, was formed from frozen moonlight. Moonstone - rough and cabbed. Cabochon is approximately 5 ct.
Moonstones come in a variety of colors. The body color can range from colorless to gray, brown, yellow, green, or pink. The clarity ranges from transparent to translucent. The best moonstone has a blue sheen, perfect clarity, and a colorless body color. Sometimes moonstone will have an eye as well as sheen. Another related feldspar variety is known as rainbow moonstone. In this variety of labradorite feldspar, the sheen is a variety of rainbow hues, from pink to yellow, to peach, purple, and blue. Moonstones are usually cut in a smooth-domed oval cabochon shape to maximize the effect. Sometimes they are carved to show a man-in-the-moon face. Personally, I like to use fin shaped cut moonstones shown in the picture below. A trio of rings all handcrafted by Kathleen Lynagh Designs, the center ring is a unique statement ring. 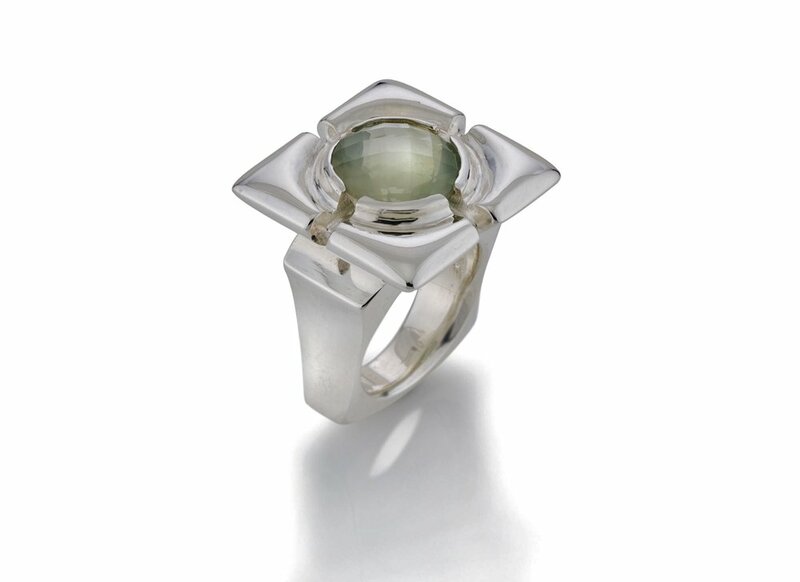 A solid sterling silver ring showcasing a fin cut moonstone set in an 18kt gold bezel. Moonstone has a hardness of 6 to 6.5. It should be stored in its own gem bag to prevent scratching. Clean with mild dish soap: use a toothbrush to scrub behind the stone where dust can collect.